IAH is actively involved with programs that provide a valuable forum for scientists and engineers who have a broad interest in global perspectives on groundwater resources and hydrogeological issues. 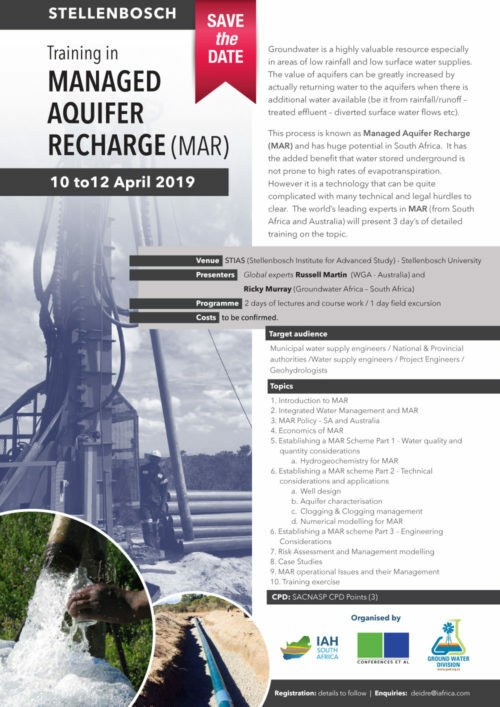 The IAH-SA-NC is affiliated with the South African Groundwater Division (GWD) and the Geological Society of South Africa (GSSA), as these organizations also have international groundwater science interests. The IAH-SA-NC intends to hold meetings at annual events of these other organizations to encourage networking among IAH-SA-NC members and others who are interested in promoting international cooperation among hydrogeologists and others with an interest in groundwater. Check the IAH-SA-NC website for meeting day and time announcements. Alternatively, contact us for meeting information. We undertake to treat your information confidentially, and will not pass them on to third parties. Should you decide that you no longer wish to receive our Emails, click on the “Unsubscribe” link at the bottom of the Emails. © 2019 IAH – South Africa.